Ariens brings their trademarked durability and robust design characteristics to the single stage platform. The new Ariens Path-Pro features everything you expect from Ariens in a lightweight, compact Sno-Thro that is easy to manoeuvre, transport and store. The Ariens Single-Stage 21 in. Gas Snow Blower is great for clearing snow from driveways, sidewalks, patios and more. 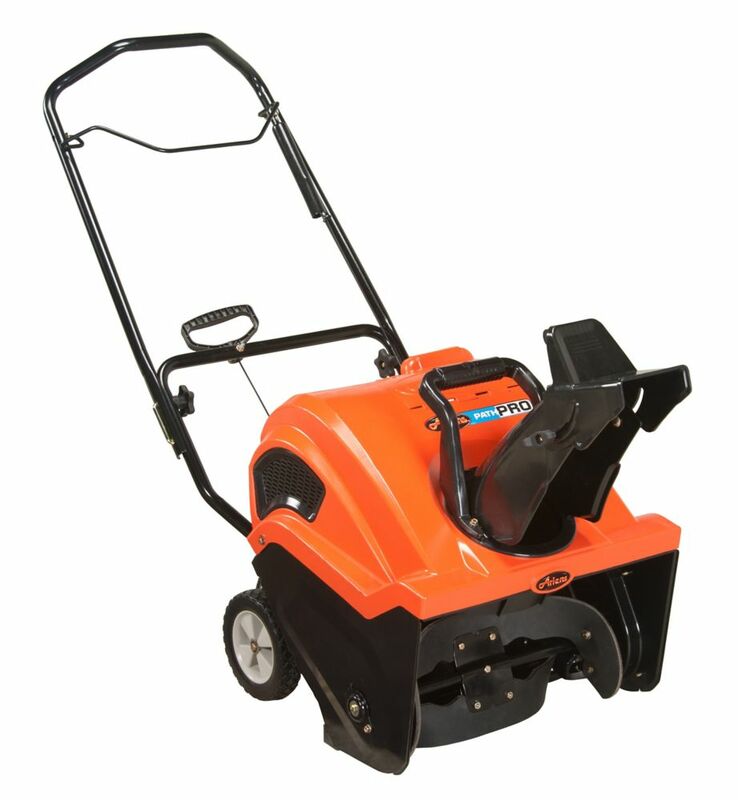 Its 208cc Ariens AX engine helps provide ample power during use and it features a 21 in. width for efficient clearing. The snow blower can throw snow up to 35 ft. and features a 210 chute rotation, allowing you to easily blow snow out of its path. The 120-Volt push-button electric start helps provide a quick and easy ignition. The Ariens Deluxe 30 2-Stage Gas Snow Thrower boasts a 306cc engine and Auto Turn steering for ease of use. Charge through snow with its 30-inch clearing path, and enjoy peace of mind thanks to a 3-year warranty. The in-dash headlight means you can get to work at any time, day or night. The Ariens Deluxe Sno-Thro is designed from the ground up to maximize performance, and incorporates a 28-inch clearing width with a 14-inch diameter impeller to ensure the housing is utilized to full capacity, pulling in more snow, and powering you through thick snow banks. Snow removal is even easier with the new automatic Auto-Turn steering feature. The Sno-Thro will turn when and where you want it to, with ultimate traction. The power of this machine comes from the 254cc Ariens AX engine combined with the dual auger belt drive to continually sustain up to 100% of the engine's power directly to the blower head, so more snow can be removed quickly. With the Power Smart lithium Ion 40-Volt cordless snow blower in hand, clearing off sidewalks, driveways and patios is no longer a tiresome chore in winter. Equipped with a 4 Ah battery, this snow blower is capable of cutting snow up to 18 inch wide and 8 inch deep in one pass. Its durable rubber-tipped auger is capable of throwing snow up to 30 ft. 180 degree adjustable chute allows you to throw snow in any direction you like, with its over-sized chute handle designed for easy use with winter gloves. The hand grip is coated with foam for comfortable use in cold winter and an over-sized auxiliary handle is designed for easy carrying. The Ryobi 40-Volt 20 inch cordless snow blower is engineered to remove snow quickly from patios, decks and driveways. With a powerful brushless motor and load-sensing technology, this Ryobi snow blower automatically adjusts power for optimal performance. This product is designed to provide consistent quiet power that efficiently discharges snow up to 25 ft. The Ryobi 40-Volt 20 inch cordless snow blower features a push button start and twin LED headlights that make clearing snow hassle-free at any time, with a 180 directional chute offering ultimate snow-throwing control. For added convenience, the Ryobi snow blower is equipped with 1 40-Volt 5 Ah High Capacity Lithium-Ion battery for extended run time. The Ryobi 40-Volt 20 inch cordless snow blower is backed with the Ryobi 5-year limited warranty and is guaranteed to deliver results for years to come. Path Pro 208cc Single Stage Electric Start Gas Snow Blower with 21-Inch Clearing Width Ariens brings their trademarked durability and robust design characteristics to the single stage platform. The new Ariens Path-Pro features everything you expect from Ariens in a lightweight, compact Sno-Thro that is easy to manoeuvre, transport and store. The Ariens Single-Stage 21 in. Gas Snow Blower is great for clearing snow from driveways, sidewalks, patios and more. Its 208cc Ariens AX engine helps provide ample power during use and it features a 21 in. width for efficient clearing. The snow blower can throw snow up to 35 ft. and features a 210 chute rotation, allowing you to easily blow snow out of its path. The 120-Volt push-button electric start helps provide a quick and easy ignition. Path Pro 208cc Single Stage Electric Start Gas Snow Blower with 21-Inch Clearing Width is rated 4.3 out of 5 by 137. Rated 5 out of 5 by Jim from Ariens hit a home run with this model! I downsized this year and purchased this model for upstate, Ny winters! This is a top knotch, super engineered consumer snow blower for those with limited space or not looking to push around a tank. Just had a 28" snow storm and the Ariens was a beast! Deep drifts require a slower and repetative approach. Easily adjustable shoot. Quiet. Ergonomic. I love the folding handles which allows me to store this in a small corner in my garage. Dont let the size fool you, this can handle a lot. I did not test in iced over, slushy and frozen snow. Compact, powerful, smart design and light weight. Buy this! You will not regret it! Rated 2 out of 5 by Dave from I've owned this model for 3 years now. Year one was a somewhat mild winter. It was hard to start ... I've owned this model for 3 years now. Year one was a somewhat mild winter. It was hard to start but started and it did the job. Year 2 was very cold. It wouldn't start at all. Took it in and they told me it wasn't tuned properly out of the box when I purchased it, $80 tune up. After the tune up it worked great, but was sometimes hard to start, which was understandable because temps were in negative territory. Year 3. Back to square one. It won't start at all and i'll be dragging it back to the shop where i'll probably have to spend another $80 on it. Disappointing to say the least, and pretty frustrating. If you're wondering, yes I run the gas out and it sits dry all summer. It's not bad gas or a dirty carb. Rated 3 out of 5 by Shirley from We haven't had enough snow yet to get a good... We haven't had enough snow yet to get a good feel on how it will work. I did notice that some snow flies out backwards when the snow is only a couple inches deep and powdery. I did not see anything in the owners manual that directly addressed that. It's the first snow blower we have had, so there is nothing really to rate it against. It is easier on the back than shoveling, however. Rated 5 out of 5 by Macdaddy from Easy to assemble, extend handle, fill with oil, Start. Quality machines. Highly recommend this pr... Easy to assemble, extend handle, fill with oil, Start. Quality machines. Highly recommend this product. Rated 5 out of 5 by Roxanna from Based on my son's comments as he is the machine's... Based on my son's comments as he is the machine's handler: This is a powerful, manageable machine that cut through the 2.5 feet of hard pack snow in the back yard with ease. We cleared a path 65ft path to the back alley gate and ckeared out the front parking/driveway areas the day after we got it. He liked it a lot, especially how far it threw the snow! But that's a guy for ya. Rated 1 out of 5 by lowpowerlab from Two issues I had which make me regret this buy. 1) Drive/transmission just failed on me after a f... Two issues I had which make me regret this buy. 1) Drive/transmission just failed on me after a few winters of use (a few uses per winter, some mild winters I barely got it out once or twice). Used it carefully (I want the $500 investment to last) so there is no question of it being abused or misused. See photo of the fail. I am hoping the replacement part will fix it, although given the internal wear of the belt, it might fail next. 2) The chute gets stuck if the handle rotates it too much towards the rear of the unit, requires complete disassembly of the plastic top, to unlatch it so you can point it forward again, frustrating to have that happen in a foot of snow to say the least. I have to remember every time to rotate the chute sideways carefully or else it could go past the no-return point. Getting this disassembled to fix both issues above reveals a pretty cheaply built frame and top assembly. Otherwise it works ok if you can start it in the freezing cold. I am not sure if I could start it without the electric start.